This dialogue-based support group is similar to our other youth support groups, but has a specific focus on topics and issues pertinent to youth of color. Groups are open to youth ages 14-20, and are held on the third Wednesday of every month from 6:30 - 8:30. 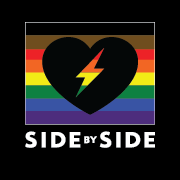 If you are new to Side by Side, please try to arrive a bit early to be introduced to the space and fill out a confidential member form. For more information contact Lacette Cross. This group is facilitated by people of color and is exclusively for youth who identify as people of color and is a collaborative effort with The Virginia Anti-Violence Project.